Cold Winter is one of those games that eluded me. I never heard of it until a few years ago and didn’t get the chance to try it until now. I found a copy complete in box on eBay for cheap so I nabbed it. 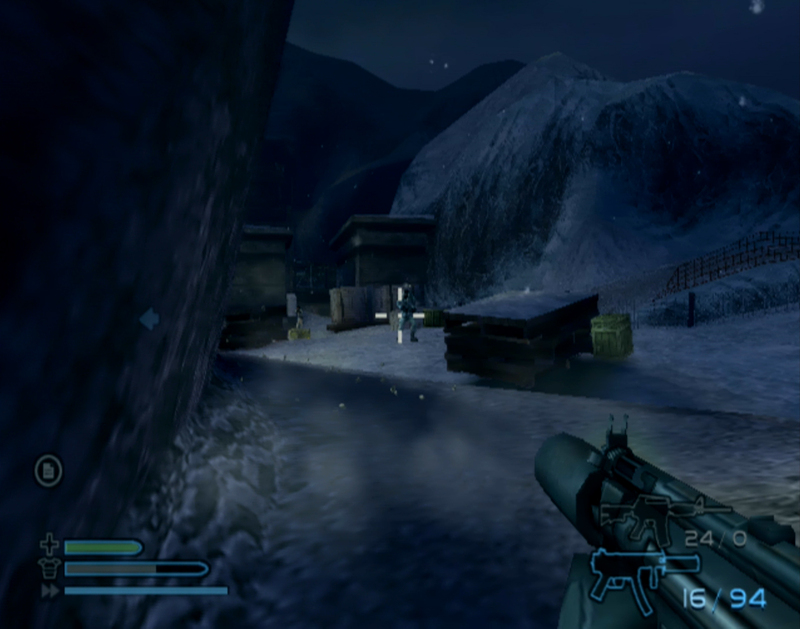 Developed by Swordfish Studios and published by Vivendi Universal Games, Cold Winter was released for the PlayStation 2 in May, 2005. I would say Cold Winter has two major attractions – the physics engine and the multiplayer that can be played online in addition to split screen. I didn’t get the chance to try the multiplayer but I did blast through the campaign. The story opens with former British SAS soldier Andrew Sterling being jailed and tortured in a Chang political prison. He works for MI6 but after being captured, they destroy all the files on Sterling to prevent an international incident. Andrew is rescued by a former acquaintance and fellow SAS soldier, Daniel Parish. Andrew agrees to work for Parish’s private security company to repay his debt to Parish for saving his life. Andrew is sent on a mission to eliminate an arms dealing cartel which leads him to discover the highly advanced missile guidance system called “Octopus”. The campaign does place a pretty big focus on the story and I kind of got into it. The voice acting is hit or miss but some of the characters are well developed. 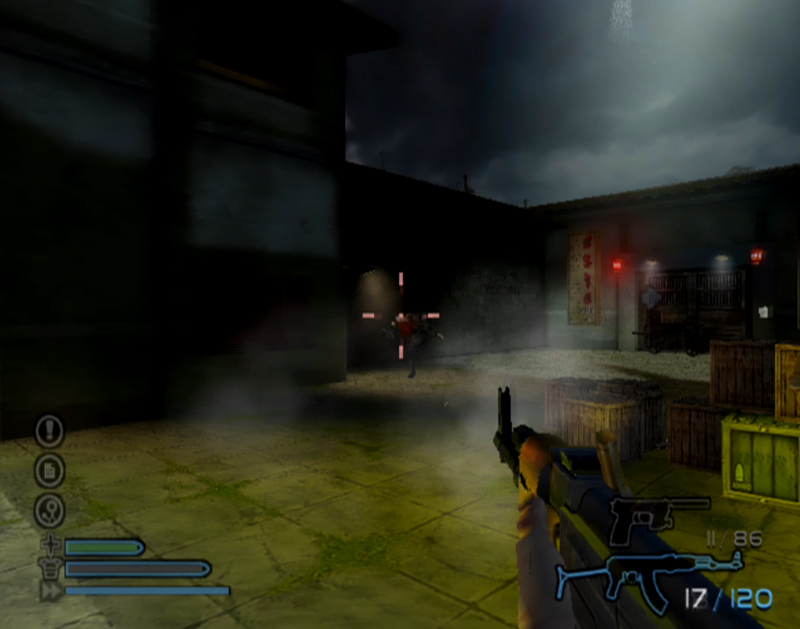 The game plays out in levels and the story is told through briefings, cut scenes, and dialogue during gameplay. You play as Andrew Sterling and he can walk, sprint, crouch, jump, smash things, and swim. Sprinting drains a stamina meter that does regenerate over time and swimming will drain your oxygen meter and eventually your health. You’re always equipped with a medipack that can be used at any time to restore health and that alone can make things feel a bit on the easy side. Body armor isn’t very hard to come by so you may want to start on the hardest difficulty available. The actual hardest one needs to be unlocked. Cold Winter does contain a pretty cool physics engine. You can pick up and throw objects, tip over objects to use as cover, drag things, push things, and bodies will ragdoll. Enemies will use objects as cover as well but, unfortunately, their AI is pretty bad and is probably the worst aspect of the game. I never really felt the need to tip objects over to use as cover since the standard environments provide plenty of static objects, walls, and structures to use as is and you can tank a good amount of damage. And because the medipack can be used at any time in addition to the frequent checkpoints, there’s not much of a penalty for dying. Enemies will just stand out in the open, they’ll try to shoot at you through impenetrable objects, and sometimes they won’t flinch if you blow one of their buddies away who happens to be standing or walking nearby. They do run around, shoot at you, throw grenades, throw smoke grenades to cover themselves, utilize weapon emplacements, but the only time they ever seem to pose a real threat is when they outnumber you. Even then, they’re not that much of a problem. Enemies have better accuracy and more health on higher difficulties. You’ll get your hands on a rather large roster of weapons. There’s different types of pistols, submachine guns, assault rifles, sniper rifles, shotguns, grenades, rocket launchers, a flamethrower, and a grenade launcher. Despite the lackluster enemy AI, the combat feels exciting, brutal, satisfying, and intense thanks to fantastic gore effects and excellent feedback when firing weapons. Ammo, weapons, and body armor can be found in crates that can either be opened or broken. Enemies will drop weapons and ammo when killed and you can search their bodies for items. The game includes a basic crafting element referred to as “combining”. You can combine items to make different things. You can make lockpicks, fire bombs, timed explosives, molotov cocktails, a mine detector, hacking device, and some other stuff. A lot of the explosives you can make I never really felt the need to use but the crafting stuff is fun and some of the items you craft will let you gain access to new areas. Cold Winter takes you to a decent variety of locations in China, Egypt, and the Himalayas. You’ll fight your way through a prison, town, compound, quarry, biological laboratories, a monitoring station, and supply depot, among other areas. The levels are pretty large, they funnel you down specific paths, but there are plenty of out-of-the-way rooms and areas you can discover. These areas are where you will most likely find weapons, ammo, body armor, and maybe even intelligence. 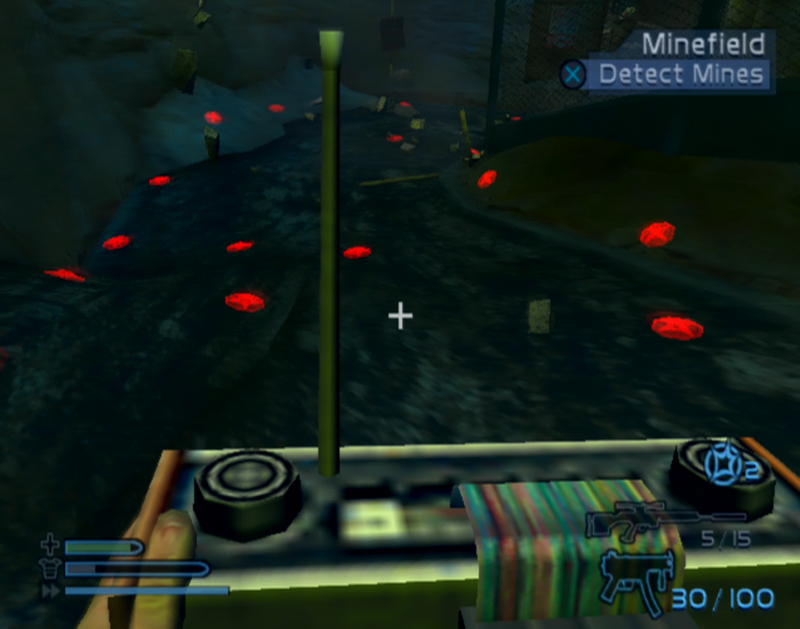 Intel is scattered all over the environments and act as a form of collectibles. Some locked doors require keys and others need to be picked. Cold Winter does contain a good amount of replay value thanks to the intel and crafting element. 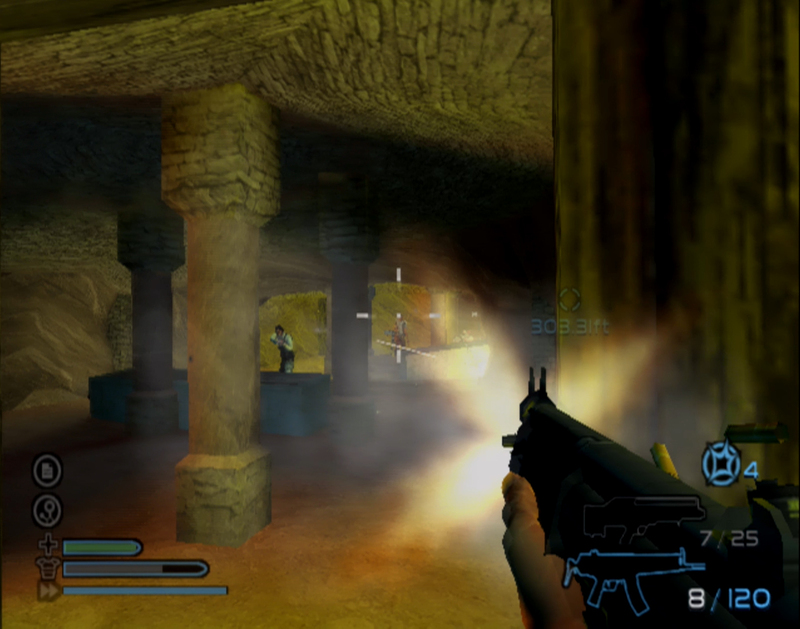 You’ll want to explore every nook and cranny so you can find all of the items, weapons, and intel. Gas Cylinders are all over the place and can explode when shot so you can utilize them to your advantage. There are some other environmental hazards like fire, electrified water, and a minefield at one point but there’s not much you need to look out for. Each level or mission provides you a set of objectives and as you progress through the mission, you’ll discover optional objectives. You are ranked at the end of missions based on the objectives you completed, accuracy, enemies killed, weapons found, intel found, and combined items found. However, I always seemed to get a “D” rank no matter how I did so I’m not really sure how it works. In fact, the ranking system might just be broken. My accuracy was never near one hundred percent but even if I accomplished every objective, killed every enemy, and found every item, I would still manage to get a “D”. You’re never forced to do anything trial and error and you’ll primarily be shooting your way through areas. You’ll do stuff like plant explosives, eliminate specific enemies, collect items, and you’ll take down some helicopters. 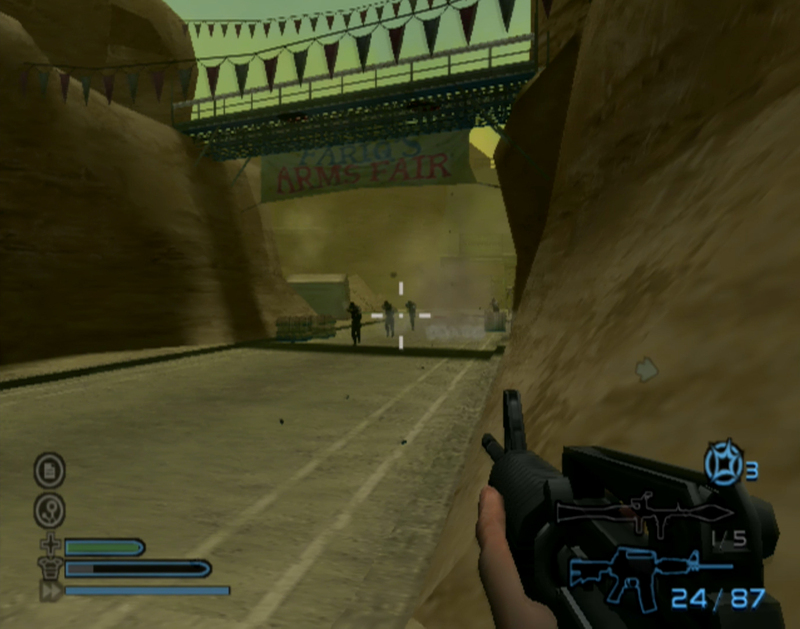 You can replay any already completed level from the level select menu and the game does get a bit more challenging in the later levels and that’s only because you’ll start encountering enemies equipped with rocket launchers. Once you get a hang of the aiming, the combat will become a breeze. Headshots are your friend and explosive weapons can eliminate groups of enemies quickly. The visual presentation in Cold Winter is a mixed bag. On the one hand, the physics, details, and particle effects are great but the actual texture work and overall look and feel is a bit on the bland side. There’s not much color, textures are a bit blurry, and I did notice pop-in. But on the plus side, bodies will go flying from explosions. Dirt, debris, and dust will kick up from bullet impacts on surfaces and objects being destroyed during firefights. There’s also a good amount of detail in the game. If you step in blood, you’ll leave behind bloody footprints. Flies will hover over dead bodies and you’ll see rats running around the environments. The gore effects are absolutely phenomenal and in my opinion, they truly make the combat as cool and exciting as it is. You can blow the limbs off enemies, you can blow a dude’s head off and watch bloody chunks fly through the air and see the head rolling on the ground, and blood will splatter onto walls and drip. Now the soundtrack is quite good. I was impressed with the music. There’s a lot of dramatic and intense tunes that are memorable and kick in at just the right times. You won’t hear music constantly but what is heard is excellent. The sound effects are also very well done. Enemies will groan, scream, and make gargling and choking noises when being shot or killed. They’ll scream and shout at you during firefights, explosions are loud, and most of the weapons fire is pretty good. Some weapons sound a bit weak but most of them sound satisfying to shoot. When it comes to the technical aspects, the frame rate is not consistent and dips frequently. Whenever there’s a lot of action, smoke, or explosions on the screen, the frame rate will just tank. I also experienced the game crash or just fail to load after a cut scene, forcing me to restart the game and load my previous save. Despite some of the game’s issues, I had an absolute blast with this. It kind of reminds me of the game Black but it has a better story. Both Black and Cold Winter give off action movie vibes. Cold Winter also reminds me of the first two Soldier of Fortune games just because of it’s impressive and satisfying gore effects. It’s a great shooter and it’s fun from beginning to end. I think the physics engine is quite impressive. It’s not as impressive as the physics in Half-Life 2 which did release before Cold Winter, but the physics and level of interactivity can make the experience very interesting. I would absolutely recommend Cold Winter to fans of first-person shooters and/or action games. I’m surprised the game doesn’t receive more recognition because it really is an excellent title. It’s got some issues but it’s certainly worth playing. The story is decent, the gunplay is fun, the physics engine is impressive, and there’s plenty of replay value here. If you haven’t played Cold Winter, definitely check it out.